A great statement on the 'comfort women' issue from Sung-Hee Choi of the Jeju Island naval base resistance and Global Network Against Weapons and Nuclear Power in Space. "A solidarity message from Gangjeong village, Jeju Island. We the people of Gangjeong are so thankful for our friends' solidarity protest in London. Since the unjust collusion on the issue of 'comfort women' between the two governments of South Korea and Japan on December 28th 2015, some of us in Gangjeong have had a small Wednesday performance of becoming the girl statue in solidarity with the 'comfort women', and with all women, in resistance to the arms companies and governments’ conspiracy to erase a critical part of our history for the sake of the South Korea-US-Japan war alliance. Today is Wednesday and we will carry out another Wednesday performance here, too. Words and songs will be recited to remember the pain of the 'comfort women' and to remind us of our task to realize justice for them, and all the women victimized by war, including the Vietnamese women killed by South Korean soldiers during the Vietnam war. Today coincides with the 11th anniversary of the designation of Jeju as 'The Island of World Peace' by the South Korean government; it is also the 4th anniversary of our declaration that the 'Peace Island' must be demilitarized. Why does this co-incidence make today’s event for the remembrance of the comfort women more meaningful? We understand that militarism and war grow at the sacrifice of democracy and women and children. To resume such horrible war preparations, the three governments led by the United States should first kill the memory of the victims. On January 18, US Deputy Secretary of State Tony Blinken remarked that the Korean civic groups in the US should support the December 28th agreement; effectively telling citizens to stop protests to Japanese and South Korean governments. 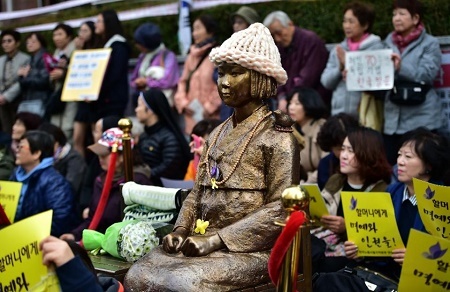 And the Japanese ruling party recently made a resolution to ask the Japanese government to demand that South Korea swiftly removes the 'comfort woman' girl statue situated nearby the Japanese embassy in Seoul. The Park Geun-Hye government in South Korea has no shame about oppressing young students are now protecting the statue day and night, disallowed to put up tents despite coldest weather in over thirty years. We the people should wake up. Such rudeness, arrogance, and totalitarianism are all for a dangerous war alliance of which missile 'defense', including the introduction of the THAAD (Terminal High Altitude Area Defense) is a key element. It will destabilize the peace of Northeast Asia and of the world. All such phenomena prove again how achieving peace is now at stake. To remember the 'comfort women', and all women victimized by imperialism and war, is a critical part of saving peace for the world now."